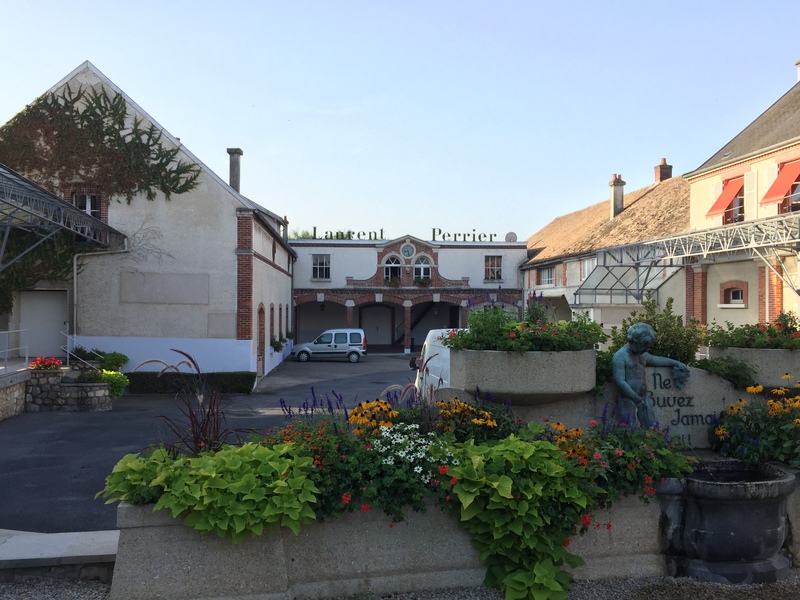 We began our final day in Champagne with a scenic drive over the Montagne de Reims, passing through some of the highest-rated and most beautiful villages in the region – Mailly, Louvois, Tauxières, Bouzy – until we reached our final destination, Tours sur Marne. As we pulled into Laurent-Perrier’s sizeable renovated estate, we were welcomed by an equally grand entourage including CEO Alexandra Pereyre de Nonancourt – daughter of celebrated entrepreneur and Champagne legend Bernard de Nonancourt – Chairman Stéphane Dalyac, Managing Director of Laurent-Perrier UK David Hesketh MW and experienced Cellar Master Michel Fauconnet. 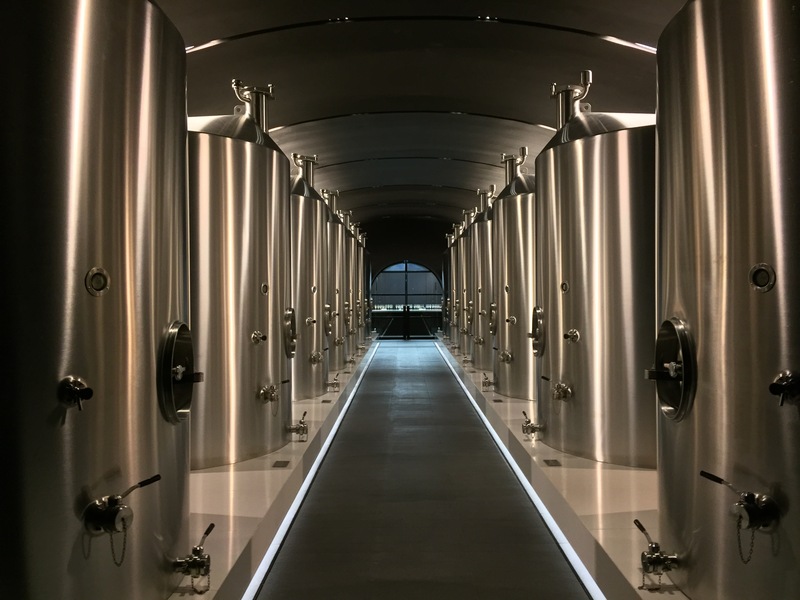 To reach our tasting room, we toured Laurent-Perrier’s impressive cellars, extended just five years ago in celebration of their 200-year anniversary. 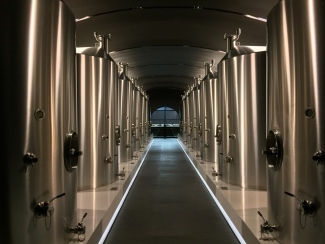 Walking the length of the imposing underground tunnels, passing one giant stainless-steel vat after another, the scale of operation is difficult to overlook. With an estimated annual production of 7.5 million bottles, Laurent-Perrier are one of the region’s biggest producers and the picture here is just part of the story – with Houses such as Salon, Delamotte, Oudinot and Lemoine all under company control, the Laurent-Perrier Group is one of the most influential in wine. Once settled in our laboratory-clean tasting room, Fauconnet shared with us the philosophy of production. As négociants, Laurent-Perrier’s vineyards supply just 10% of their grape requirements, leaving the purchasing team to procure the rest. However whilst not owned by them, they oversee management of a further 15% of their supplying vineyards and pick grapes from a further 5%, taking their total self-sufficient harvesting figure to 30%. Operating on long-term contracts, Fauconnet and his team rely on the Champenois, whom he claims are “very faithful.” As a Chardonnay house, 45% of their grapes are white, a position of quality it has taken them 60 years to engineer. 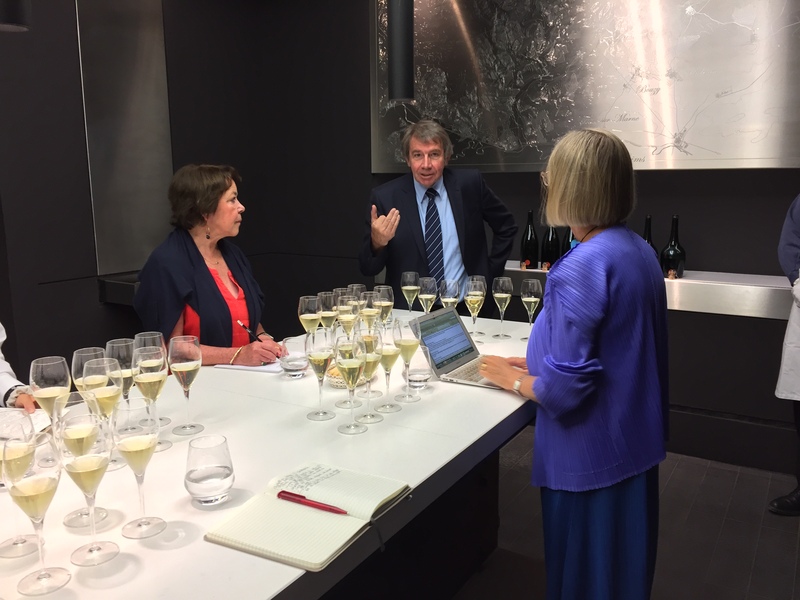 As we will be comparing Vintage 2006 with Grand Siècle NV at our Prestige Cuvée vs Vintage tasting with Jancis Robinson in October, we asked to research the tasting concept with Fauconnet here in Champagne. The team thus kindly presented three Brut Vintages and three Grand Siècle blends (with the corresponding vintage as a base), all served from magnum. We tasted the three vintages first: always a 50/50 blend of Chardonnay/Pinot Noir but from different sources each year, all three had been disgorged in early 2017 to allow for fairer comparison. Some creaminess comes through with a little herbacousness and bright chalky undertones. Seems quite dry, can hardly notice the dosage. Some good lemon and citrus elements and some yeasty character on the palate. Chardonnay seems to dominate and lovely fresh acidity. A maturer nose and more herbaceous character than 2007. Has lots of citrus and lemony character and a huge whack of chalkiness. Very fine mousse. Loads more fruit on the palate than comes through on the nose. Lots of pastry, yellow plums and a nice zing to the finish. Slight cellar smell, typical of 2004. Some chalk at first on the nose. Fuller mouth-feel and richness coming from the creamy character. Lots of lemon sherbet notes with some ripe apple flavour and great length. Seems like light dosage because of the fresh acidity. As we tasted, Fauconnet commented that Laurent-Perrier is “not really a vintage house” (the latest 2007 release is just the twenty-eighth vintage since 1950), and told us: “The goal is to express the special characteristics of the year, not to make a consistent style.” Fauconnet has been using the same 8 g/l dosage since the millennium and notes that they roll-over vintages quicker than other Houses, leading to maturer champagnes on the market. Laurent-Perrier don’t do prestige cuvées quite like other producers. 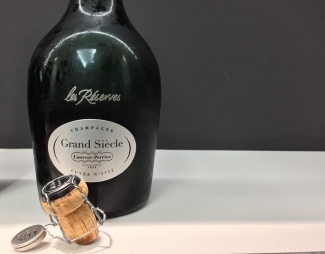 Rather than the typical superior vintage blend seen elsewhere, Grand Siècle is a non-vintage wine, drawing off Bernard de Nonancourt’s speciality: blending. “It’s always a blend of vintage years, always Chardonnay-dominant, and it contains only grands crus that correspond to the vintages – up to a maximum of 11 out of the 18,” Fauconnet explained. Although the crus vary blend-by-blend, some Chardonnay villages are fairly consistent. “Le Mesnil provides the spine, Avize the finesse. For Pinot, we usually prefer south of the Montagne de Reims – Bouzy, Aÿ, Tours,” he added. 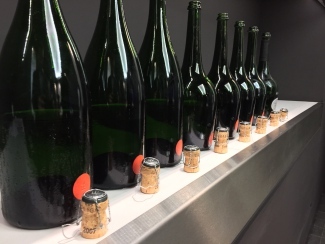 As our samples were poured from the elegantly designed magnums, David Hesketh highlighted the distinctive sound produced from the unique bottle shape, affectionately termed ‘Le Glug’. As we were comparing Grand Siècle blends with base vintages corresponding to those tasted above, the first two blends we tasted were not yet available on the market. The third blend we tasted is the current release and the fourth a past release. Lemon peel with some orange floral notes. Great weight on the palate, very fine and delicate yet quite fat and rich. Loads of length and power of fruit. Lemon sherbet notes again and loads of refreshing acidity. Great balance, freshness and very elegant. Coming back later, this has hints of a reductive smokiness that adds to the wine. Delicate lemon on the nose. A chalky character comes through on the palate, with bundles of fruit like citrus, orange and ripe apple freshness. Loads of weight and great length. Still very young and fresh, will gain more complexity from more lees contact. The nose has loads of freshness, richness and more creaminess. The mouth-feel has a very fine subtlety. Some hints of honey and slight oxidative notes come through. Much more creaminess and pastry flavours on the palate, which comes even more forward with time in the glass. Quite reductive nose but has a smokiness that is adding character. Loads of lemon, ripe apples and yellow plum notes. Good weight. With time in the glass more lime and smokiness comes through stronger. The first creation of this unique cuvée was a blend of 1955, 1953 and 1952, launched in 1959. Since then, there have been twenty more blends, making the current release – 2004, 2002 and 1999 – the twenty-first. In each blend of Grand Siècle, the youngest vintage typically provides the highest contribution – usually around 55%. Although vintage is important, Fauconnet took care over portraying the correct message of his prestige cuvée. “The vintages serve Grand Siècle, they do not determine Grand Siècle,” he shared. The philosophy is to stay true to the style of Grand Siècle, creating a consistent champagne year-upon-year. For this reason, they prefer not to communicate the vintages contained in each blend, as they are simply launched when they are ready to drink and should be consumed within 18 months of release. Our final treat was a magnum of Grand Siècle Les Réserves. Incredibly rare, this series of late-releases have aged for over twenty years on the lees and are kept only in magnums or jeroboams. Produced to showcase the incredible youth of Laurent-Perrier champagne after two decades of ageing, the example we tasted was certainly still delightfully expressive. Hint of smokiness and loads of lime and lemon on the nose. Sherbet flavours on the palate and great mouth-feel. Soft, saline and limey, this has a smokey toastiness similar to DP! Bit of time in glass and the creaminess and pastryness comes forward. Great length. One cannot justifiably deny the innovative nature of this respected Champagne House. The first producer to make a rosé by maceration, the first to introduce the concept of a zero dosage blend and the first to switch to stainless-steel vinification; they pride themselves on pioneering the winemaking of tomorrow. Today, Bernard de Nonancourt’s great legacy lives on in the leadership of his daughter. Being among the 10% of producers to use whole corks rather than layered alternatives, Laurent-Perrier’s latest trailblazing project involves the employment of a Cork Quality Control Specialist: an expert female employee who monitors batches of corks that have been soaked in water, checking them three times a day for TCA taint.